Location: Between Bute Building (N) and University Registry (S), with extension backing on to registry. Cathays Park was purchased in 1898 by the Borough of Cardiff from The Third Marquess of Bute at a cost of £160,000 and developed as a civic centre to a layout by William Harpur. Cathays Park was developed over three-quarters of a century to become the finest in Britain reflecting Cardiff's status as city and eventually taking on a national importance as civic centre of the capital of Wales. A competition for Glamorgan County Hall was held in 1908 and won by E V Harris and T A Moodie; the building opened in 1912. 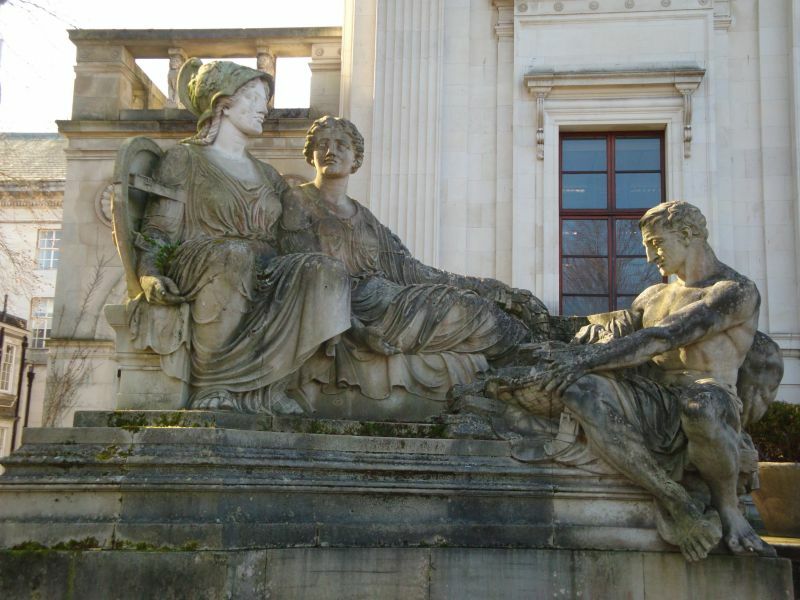 The building's Portland stone facing, and monumental Classical style follows the pattern for other buildings in Cathays Park. In 1932 a large block was added to SW, attached by a bridge; the architects were Ivor Jones and Percy Thomas, some extensions in inner courtyard of 1950s and later. County Hall forms an essential part of Cardiff's civic centre, the finest in Britain. Mezzanine windows with metal glazing. Above portico, balustraded parapet with windows behind. Main steps flanked at podium level by monumental groups of sculpture by Albert Hodge; to L, (representing mining) Minerva and female figure receiving offering of coal from heroic miners, to R, (representing Navigation) Neptune in chariot drawn by seahorses. At top of steps, 2 stone obelisks bearing bronze lamps. To either side of portico, a projecting pilastered end pavilion of 1 bay, window with balcony, relief obelisks to attic storey. Against each return, 1 storey entrance loggia with arches with iron gates to front, tripartite arched openings to sides, paterae to spandrels, balustrade with lion balusters, iron grille to windows over. Side elevations have towards rear, arched opening with relief heads to keystones, 2-level window and balcony; 6 windows to E, 3 to W. Rear elevation of 9 windows, 4 storeys, ie basement and 2 storeys plus attic above deep cornice, steeply pitched green slate roof with Portland stone chimneys with lion head reliefs. Squarish windows to attic and upper floor; main floor rectangular windows have bracketed hoods, central window emphasized by shallow bay with trophy and obelisks over. This floor has balcony running full width of facade, supported on deep paired scroll brackets over basement with segmentally-headed windows, and broader central doorway. To each end, wing wall with archway with iron gates, statue of cherub (by Arthur Broadbent). Extension of 1932 in sympathetic style, and same materials to SW, to rear of the University Registry, connected to main building by bridge. In simplified version of style of rear elevation of main building. Three storeys over rusticated basement, banded quoins, deep cornice; small-pane metal glazing. Principal elevation to rear, facing North Road, of 12 windows, with central archway (to inner courtyard) with stepped voussoirs, galzed tympanum, decorative iron gates. On ground floor, 2nd and 11th windows have bracketed pediments and shallow balconies. Side elevations of 10 windows. Courtyard faced with yellow brick, (rear of E block extended 1950s, and modern prefabricated infill offices). To rear of council chamber, suite of Committee Rooms in late C17 style, heavy stone chimneypieces and overmantels; heavy ceiling wreaths, oak panelling. At rear corners of building, chairmen's offices in similar style. To each side of entrance hall apse, stone stairs (stone balusters), rise to landing lit by arched windows with iron grilles. Corridors with classicising doorcases and painted doors with fielded panels; generally simple cornices etc, but former chief executive's suite has more elaborate detailing, marble fireplaces etc. Secondary staircases with wrought-iron rails. Later block has 2 committee rooms in late C17 style, 1960s banquetting suite, offices with 1930's and 1950s partitioning, stairs with wrought-iron rails. Graded I as amongst the finest examples of Early C20 civic architecture in Britain with ambitious exterior and extremely interesting interiors, all virtually unaltered. The interior is remarkable not only for its refined architectural spaces but for the survival of fittings including panelling, integral seating to council chamber etc. Part of a group of exceptionally fine public buildings in Cathays Park which form what is certainly the finest civic centre in Britain. In addition to its architectural interest, the building and its setting express Cardiff's claims to be a city of international importance at the peak of its economic power. Between Police HQ Building, and Former Glamorgan County Hall. In centre of Alexandra Gardens. Situated to N of the castle between North Road and the dock feeder. To R of Bute Building, facing Welsh Office building.